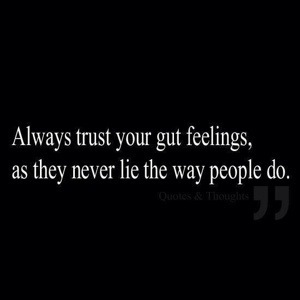 If I could give one piece of advice I would say to “Trust Your Gut”. Clients pay me a lot of hard earned money so that I can teach them to trust and use the gift they already have that is not only powerful but very effective. Their instinct. The problem is they don’t trust themselves enough to listen. I spend countless hours reviewing with clients what their perspective was at the beginning of a recently failed relationship. I ask them to look back with me and ask themselves in retrospect, did they see any red flags? Did they see or hear something from him or her that struck them as bothersome? Your instinctual sense of something is keenly accurate. Too many people second guess themselves and find that the very thing that alerted them in the beginning of a relationship with that person was very often the impetus of the relationship not working. For those of you who were brought up in homes where there was an addiction to alcohol or drugs, you have the best instinct of all. I call this your “Superpower”. When a parent has an addiction to alcohol or drugs, children learn to sense the predictability of unpredictability. Addicts are inconsistent, unpredictable, they break promises, and create an environment of fear that also produces shame in their children. After a while the child develops a very good sense of being able to “read” mom or dad. This default skill develops in adulthood into a sense of “reading” people very quickly and most often quite accurately. Look back now at any relationship in your life that didn’t work for you. Can you recall if the reason was something to do with what you spotted early on and just ignored? Learn to trust your instincts and listen to yourself, because in the end your probably right. Excellent advice! Your intuition is there for a reason – we need to learn to listen to its whispers before it starts to scream at us.